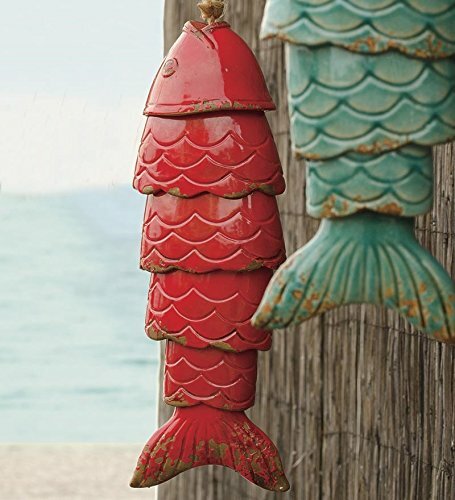 Our colored porcelain koi fish wind chime will be your best catch of the season. Hanging from your porch or deck, like they've just been caught from ancient Japanese waters, these weather-resistant and artistic wind chimes will create deep, relaxing tones every time the wind blows. In Japanese culture, koi fish represent loyalty, friendship and love, making this outdoor garden art not only pleasing to the eyes an ears, but symbolic as well. Crafted with porcelain and clay to appear aged, these unique chimes feature detailed fins, tails, eyes and lips. Hang these serene yet brightly hued koi fish near your yard or garden retreat to instill the calming nature of the sea in your outdoor décor. This listing is for Red. Dimensions: 15L x 4¾w this listing is for Red.